Our heavy duty roof rollers feature a heavy-duty, contractor quality construction, available in various weights and widths to best suit your needs. 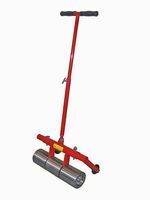 Our 25 lb roof roller features a 5" wide, polished steel drum with a collapsible T-handle. The 35 lb steel roof roller has three individual rollers that easily adjust to fit uneven surfaces. Our 75 lb roof roller also features three individual rollers, as well as removable legs and an adjustable handle. Our 100 lb heavy roof roller is built to conform to irregular surfaces and features removable legs. Contact us if you have any questions about our roofing roller products. This steel roof roller is heavy-duty and contractor quality. It has three individual rollers and adjusts to irregular surfaces. The removable legs allow this product to remain standing when not in use and aids in transport. This AJC roof roller is heavy-duty and contractor quality. It has three individual rollers and adjusts to irregular surfaces. Please note that this does not come with removable legs! Heavy Steel Roof Roller 170-16S75 - 75 lb. Heavy Steel Roof Roller 170-16S35 - 35 lb. Heavy Steel Roof Roller 170-5S25 - 25 lb.